I don’t advertise on my blog. But every odd Saturday, I’m going to do a giveaway. My logic: Because you suffer through this blog, you deserve free stuff. This week’s is for a funky iPad case (for a regular or a mini iPad). In particular, it’s for the Speck iGuy case for the iPad and iPad Mini. The best thing? MobileFun.com will ship it to you anywhere. They’re that awesome. Even if you live on Planet Star Wars. Alone. With Harrison Ford. Young or old. Sorry, I was daydreaming for moment. To enter, just leave a comment. Tell me your shoe size. Or your favourite Star Wars character. Or your favourite Teletubby dude. Or whatever. Enter by Thursday. The winner will be announced Friday or Saturday, depending on how the stars align. Also, feel free to check out their other iPad Mini cases. After all, they’ll ship to Krypton. 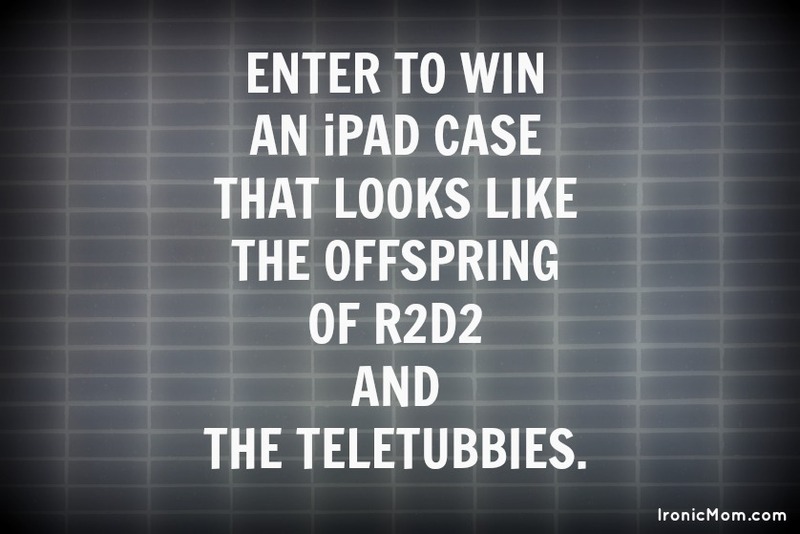 Also, if you don’t have an iPad, enter anyways. I’m a believer that the cart sometimes comes before the horse. Surely if one were going to fling an Ipad out of a window to the concrete below, it is only right and proper that you do it so someone else’s Ipad, not your own? Entirely a free choice, of course, to decide whether to fling the Ipad owner out of the window with it. Defenestration was a favoured method of hitting for certain Mafia contractors. Less popular now because of widespread CCTV. I’m hoping that in the new Star Wars they have teletubbies. And they fight JarJar Binks. I do like Star Wars. But my favorite Star Wars story is Carrie Fisher’s Wishful Drinking, which I think is hysterical. And not really a Star Wars story, but still. Given that my dd has been saving up for an ipad for months and is almost there this would be a nice ‘safety’ feature. I’m going to hope the stars align in my favor. Perhaps an iPad case will convince my husband I need an iPad. No? Well, then I would have the best present for my almost 13 year old sister and her iPad. No, I’m not filled with bitterness and rage that my baby sister has an iPad and I don’t. Not. AT. ALL. I wear a size 7 & I would take Harrison Ford at any age thank you. If I were to get one of those, I would never get to use the iPad again. The kids would always be harassing me for it. My shoe size is 11. My favorite Star Wars character to throw into a singularity would be Jar Jar Binks or either actor they used for Anakin. I’ve never seen Teletubbies, but my favorite one is the one Jerry Falwell found himself strangely attracted to. I once had to dress as a Teletubby at work for Christmas. Normally this would be ok but I am a butcher so picture the scene of a crazy La La with a cleaver and a really sharp knife hacking away at dead things. Just the image you want your little darlings to see on your shopping trip for some sausages! I have photo proof but fear more childrens sweet dreams may be shattered if such photos surface on the internet! I have been tempting the gods by NOT having a case for my iPad. My weight. Wait. Wait. I didn’t have a chance to love you. John Waite. Wait until your father gets home. Can’t wait until your book comes out. Loved Princesss Leia. When I am nervous, I still roll my hair up into those little braided balls. TechSupport was Tinky Winky for Halloween this year. I thought he was going to get killed. As it turns out, no one remembers much about the Teletubbies. I don’t have an Ipad but if I got me a case I would need to fill it no? Don’t really watch Star Wars or Teletubby (not going to apologise for it either) but I drink wine, alot and have been known to drop things while doing so. Now I have to take myself out of Mommy time out and go play with my children again…will it ever end? Favourite Star Wars character has to be R2D2, in orange I think. Oh, and my shoe size is 7 1/2. I would loved to enter to win this if the contest is still going on. I don’t know a thing about Star Wars(although my husband could tell you almost everything about it) and I really don’t remember much about Teletubbies, my kids never really cared for them. So guess I’ll just leave my shoe size which is a 7.5 or an 8 both of with need to be wide. Thank you for such a wonderful blog and all the great stories on it! The i-pad is a spectacular babysitter, and should be protected at all costs!!!!!! Shoe size = 8 1/2 W Star wars dude…hmmm? The kid before he becomes hans solo I guess. OK, I guess he already was Hans Solo…. Er..I’m not trying to win, but I never put anything about Star Wars, because I’ve never seen star wars. An entire period of the post modern Zeitgeist has passed me by. I am ignorant of complete threads of conversations of my contemporaries. Fear not, Brendan. You get major points for using “Zeitgeist” in your comment. May the force be with you anyway! This would be great for my son, who has a speech disorder, and is ALWAYS on the iPad! He would LOVE it!!! By the way, my shoe size is 8.5, depending on the shoe!!! LOL!!! My shoe size can vary from 6 to 8 depending on how cute the shoe is, the price, and comfort (comfort is always last in fashion). Thanks for posting the awesome contest!!!!! Awesome case! I have a friend who’s kid already broke their iPad twice. This would be perfect! i wear a size 8! my aunt owns one of these cases. its perfect for when her 3 and 2 year old girls want to play on the ipad! love your blog! My shoe size is 9 (although it was 8 before I had kids :/ ). Don’t really know much about Star Wars or Teletubbies (despite having a 2 & 6 year old, maybe I’m just really lucky), but that iPad case is super cute! And it’s not because I want to see what happens when my kids eventually toss their father’s ipad off of a balcony. Nope, not at all. Because that would be WRONG. Thanks to all who entered. The winner will be announced Monday, March 18.